Jake and Tanya. 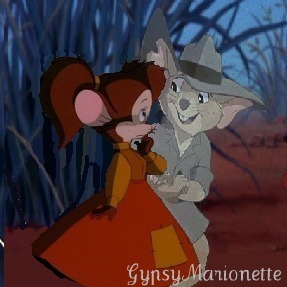 Jake from the Rescuers Down Under and Tanya from An American Tail. Wallpaper and background images in the डिज़्नी क्रॉसोवर club tagged: disney crossover animals jake tanya gypsymarionette. Ariel My Darling Will आप Marry Me? OMG I luv Tanya! Great couple idea! Tanya was so adorable in 'Fievel Goes West' and I've always liked Jake as a character. This couple makes more sense to me than Jake/Bianca. Plus how could Jake resist Tanya? She's cute, talented, and has a lot of spirit. Bianca, though I have nothing against her, seems more like just a pretty face. Ya I liked Tanya better in the 2nd movie. I dont really like JakexBianca either. I like BasilxBianca. I can totally see Jake and Tanya together. Well...except for the "Mystery of the Night Monster" Tanya. I know. They ruined her.